GIS&T has traditionally provided effective technological solutions to the integration, visualization, and analysis of heterogeneous, georeferenced data on land. In recent years, our ability to measure change in the ocean is increasing, not only because of improved measuring devices and scientific techniques, but also because new GIS&T is aiding us in better understanding this dynamic environment. The domain has progressed from applications that merely collect and display data to complex simulation, modeling, and the development of new research methods and concepts. This entry was first published on July 31, 2017. No earlier editions exist. marine - what is found in or produced in salt water, as opposed to freshwater. Synonymous with “ocean” or “sea.” Regarding marine science, marine community, marine applications, marine GIS, etc., these terms also refer to the deep ocean (e.g., Pacific) and marginal seas (e.g., Mediterranean), as well as to estuaries (at the coastal interface between rivers and the ocean), and to the coast itself. In some cases, coastal environments are treated separately because marine and coastal GIS developed fairly independently of each other, and coastal applications of GIS, which incorporating both basic and applied science, also involve policy and management. But this is fast changing because the datasets are essentially the same regardless of how they are used (i.e., for basic or applied science, conservation, education, applied commercial use, etc.). ocean - equivalent to marine and encompassing both the open ocean and the nearshore or coast. Often referred to in the singular given the ocean as holistic part of the Earth’s system, but can also be equivalent to “oceans” if distinguishing between separate bodies of water such as the Pacific Ocean vs. the Atlantic Ocean. Geological Oceanography (Marine Geology): the study of rocks and sediments found within the ocean, and of the processes responsible for their formation; also, the study of the morphology (shape) of the seafloor. Marine Geophysics: the study of the rock structure within the ocean basins, the properties of rocks such as their magnetism, and the occurrence and cause of earthquakes. Biological Oceanography (Marine Biology) -- concerned with the organisms that live in the ocean, and their relationships to the environment, including marine ecology and fisheries science. Although such categories exist, marine scientists tend to be broad in their outlooks and often are not easily placed into only one of the above "boxes." In addition, marine science research tends to be highly interdisciplinary, involving a team of investigators that combine their expertise to better understand the ocean. maritime - referring more so to the marine industry rather than to marine science. This includes commercial shipping, submarine telecommunication cables, port management, maritime defense/intelligence, offshore energy (e.g., oil and gas, wind, wave, or tidal energy), commercial fishing and aquaculture, engineering firms building underwater lighting, instruments, vehicles/robots, and the use of bathymetry in national and international hydrographic (not hydrologic) offices more so for nautical chart production than for elucidating the shape and structure of the ocean floor for scientific studies. GIS has traditionally provided effective technological solutions to the integration, visualization, and analysis of heterogeneous, georeferenced data on land. In recent years, our ability to measure change in the ocean is increasing, not only because of improved measuring devices and scientific techniques, but also because new GIS technology is aiding us in better understanding this dynamic environment. The domain has progressed from applications that merely collect and display data to complex simulation, modeling, and the development of new research methods and concepts. The importance of GIS&T for Marine Science lies largely in the need to provide effective mapping tools and techniques to respond to enormous disasters such as the Deepwater Horizon oil spill in the Gulf of Mexico and the Tohoku-Oki earthquake and tsunami in Japan. It is also motivated by a sincere desire to assist in the implementation of the national and international ocean policies, particularly in coastal and marine spatial planning (CMSP), for which GIS provides a crucial decision-support engine. Further, we know that the ocean can also be a dangerous place. The news is replete with stories of the hazards of hurricanes, tsunamis, rogue waves, sea level rise and coastal flooding, shark attacks, toxic spills, oxygen-poor "dead zones," even modern-day pirates. This is reflective of the ocean in a state of deep crisis. Hönisch et al. (2012) discuss how the ocean is acidifying faster today than in the past 300 million years due to absorbing the vast amounts of carbon dioxide that humans have put into the atmosphere since the start of the Industrial Revolution. We have changed the ocean to the point where there will be serious impediments to the marine biological carbon pump which ultimately controls the climate system, oxygen levels will plummet, and there will be a wide range of negative consequences for ecosystems, fisheries, and tourism (e.g., National Research Council, 2010). Hazards, including the analysis of risk and potential loss of buildings and infrastructure due to hurricane winds, coastal floods, tsunamis, and nearshore or onshore earthquakes. Marine debris mapping and tracking, especially in situ as small plastics are not detectible with satellite imagery. Analysis of fishery closure areas, protected resources, Gulf Coast Environmental Sensitivity indices, at-risk Species, and Federal Status to illustrate some of the environmental impact of the 2010 Deepwater Horizon spill. Professional and amateur boat racing, voyages for various causes, and unusual high-publicity sporting events at which we can offer and advertise live, map-based tracking of assets and participants. 4.1 Vertical datum calculations (decimeter- or centimeter-level) to help researchers transform data between ellipsoidal, orthometric and tidally-referenced elevation data at the shoreline. This is absolutely critical for coastal surveying, coastal geomorphology, and coastal terrain models that connect nearshore bathymetry for terrestrial DEMs that are used for storm surge, hurricane, and tsunami inundation modeling. This will involve deciphering which vertical datums are most important to our users, finding out if transformations between them already exist that are trusted and authoritative by industry, how they are implemented and despite what limitations, and how best to implement in GIS&T. Users need the ability to combine several datasets that may be expressed in incoherent vertical datum/coordinate systems and vertical positioning that is precise (i.e., not just a “z” value, but a “z” value relative to a precise reference). 4.2 Improvements in visualizing multivariate data that changes in time and space, including on the web and in mobile devices. Satellites can clearly map the ocean surface, and acoustic sensors (as well as aircraft satellites to a very limited extent) can map the seafloor, given time and coverage. But marine scientists currently have a limited view of the water column between the sea surface and the seafloor. This view is also extremely limited in real time and with a limited capacity to store the data, replay the data or run further types of analysis. Water column data need to be integrated with other data sets such as bathymetry, bottom backscatter, subbottom, seafloor characterizations and more, so that a complete picture of the ocean environment under analysis can be obtained. There is a critical need to study the internal structure of features in the water column such as plumes (hydrothermal vent plumes, oil well plumes as in the Gulf of Mexico spill) or schools of fish to obtain fish stocks dynamics, spawning grounds, seasonal habitats and to discern the impact of the climate change on these vital resources. To exploit water column data, an efficient means of reading, processing and analyzing the data is required, including time-dependent 3D analysis (weeks/days/hours/minutes/ seconds). 4.3 Development of more tools that facilitate collaborative decision-making through authenticated access to data. This should better enable consensus-driven decisions about ocean management, protection, and commerce. Ocean issues are often opaque to one or more segments of a user base. 4.4 Development of more database workflows that can be successful in the absence of real-time Internet connections. This is especially as ships often do not have high-bandwidth access to the Internet at sea, and restrict transmissions of email and digital data during periods when they connect to a satellite or port for transmission and reception of these files. 4.5 Improve marine science applications of GIS&T to better support ocean numerical models. In the ocean, one of the most widely-used models is the Regional Ocean Modeling System or ROMS (Shchepetkin and McWilliams, 2003 and 2005). Its algorithms are used for understanding a wide array of processes, including vertical mixing and biogeochemical processes in the open ocean, sediment transport and storm-surge inundation of coastal areas and sea ice movement. And yet models such as ROMS pose great challenges for GIS&T, as they are often not uniformly spaced, and may be comprised of either unstructured triangles or structured curvilinear grids. There is a great need for tools to handle these grids in a more standardized way, allowing for the possibility of standard access to data on the model’s native grid. In addition to providing better support for netCDF4 (Network Common Data Form) and HDF5 (Hierarchical Data Format), the use of netCDF Markup Language (NcML), an XML representation of netCDF metadata, should be investigated, as it contains attributes that work effectively with the third-dimension. Marine science continues to provide interesting and challenging applications for GIS&T, applications that will advance the body of knowledge in GIS design and architecture, as well as the body of knowledge in the broader field of marine science. The future is bright for the continued evolution of applications that will effectively plan the exploration and discovery of the undiscovered parts of our planet, to ensure safety on the oceans from hazards and storms, to sustainably extract energy, food, and other services, and to geodesign ocean space among its multiple and simultaneous uses. 1 The source of many of these facts is the World Bank's Global Partnership for the Oceans, which in turn draws on a number of published studies. Included also are economic factors of ocean usage as summarized by the Committee on the Marine Transportation System and the Environmental Science Division of the Argonne National Laboratory. National Research Council. (2010). Ocean Acidification: A National Strategy to Meet the Challenges of a Changing Ocean, Committee on the Development of an Integrated Science Strategy for Ocean Acidification Monitoring, Washington, DC: The National Academies Press. Shchepetkin, A.F. and McWilliams, J.C. (2005). The Regional Ocean Modeling System: A split-explicit, free-surface, topography following coordinates ocean model. Ocean Modelling 9:347-404. Identify, understand, and help overcome the barriers to use of scientific oceanographic data by GIS users, as well as increase the use of GIS tools by ocean science and resource management users. a. Group 1: multidimensional data? b. Group 2: sensors and sensor formats? d. Group 4: analysis and workflows? e. Group 5: data distribution? a. Group 1: marine geology/geophysics? b. Group 2: phys/chem/ocean observing? c. Group 3: marine ecology? d. Group 4: fisheries science? e. Group 5: Coastal and Marine Spatial Planning? 2. What is the blue economy and why is it important? What role must GIS&T play? 3. What should geodesign of the ocean entail, including datasets, stakeholder groups, tools, and modes of communication? 4. What are the top 20 most valuable data layers for marine spatial planning (or pick your favorate application of marine GIS)? Why are they valuable? What are the impediments to accessing or maintaining them? 5. How would you use GIS to find out the location of the next major city to be affected by sea level rise and how much will the water rise over a 2-year period for that city? Baker, K. S., and Chandler, C.L. (2008). Enabling long-term oceanographic research: Changing data practices, information management strategies and informatics. Deep-Sea Res. II 55: doi:10.1016/j.dsr2.2008.05.009. Best, B. D., Halpin, P. N., Fujioka, E., Read, A. J., Qian, S. S., Hazen, L. J. and Schick, R. S. (2007). Geospatial web services within a scientific workflow: Predicting marine mammal habitats in a dynamic environment. Ecological Informatics 2 (3):210-223. Burke, L., Reytar, K., Spalding, M. and Perry, A. (2011). Reefs at Risk Revisited. Washington, DC: World Resources Institute. Canessa, R. (2008). Seascape geovisualization for marine planning. Geomatica 62 (4):375-392. Claus, S., De Hauwere, N., Vanhoorne, B., Deckers, P., Souza Dias, F., Hernandez, F. and Mees, J. (2014). Marine Regions: Towards a Global Standard for Georeferenced Marine Names and Boundaries. Marine Geodesy 37 (2):99-125. Devillers, R., and Gillespie, R. (2008). Charting inner space: Geomatics for a blue planet. Geomatica 62 (4):357-358. Falconer, R. K. H. (1990). Experience with geographic information systems (GIS) in the marine world. Hydrographic Journal 58:19-22. Green, D. R. (2008). Coastal and marine geospatial technologies. Journal of Coastal Conservation 11:183. Halpern, B. S., Walbridge, S., Selkoe, K. A., Kappel, C. V., Micheli, F., D’Agrosa, C., Bruno, J. F., Casey, K. S., Ebert, C., Fox, H. E., Fujita, R., Heinemann, D., Lenihan, H. S., Madin, E. M. P., Perry, M. T., Selig, E. R., Spalding, M., Steneck, R., and Watson, R. (2008). A global map of human impact on marine ecosystems. Science 319 (5865):948-952. Halpin, P. N., Read, A. J., Best, B. D., Hyrenbach, K. D., Fujioka, E., Coyne, M. S., Crowder, L. B., Freeman, S. A., and Spoerri, C. (2006). OBIS-SEAMAP: Developing a biogeographic research data commons for the ecological studies of marine mammals, seabirds, and sea turtles. Marine Ecology Progress Series 316:239-249. Hamre, T., Mughal, K. A., and Jacob, A. (1997). A 4D marine data model: Design and application in ice monitoring. Marine Geodesy 20 (2-3):121-136. Ledoux, H., and C. M. Gold. 2008. Modelling three-dimensional geoscientific fields with the Voronoi diagram and its dual. International Journal of Geographical Information Science 22 (5):547-574. Lockwood, M., and Li, R. (1995). 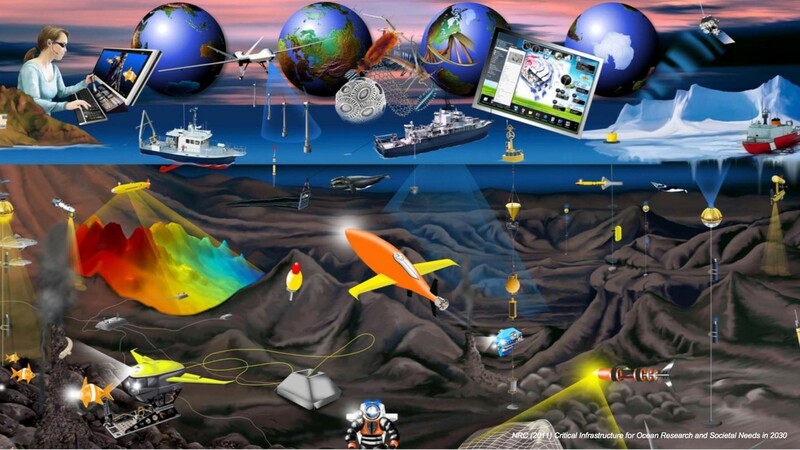 Marine geographic information systems: What sets them apart? Marine Geodesy 18 (3):157-159. Manley, T. O., and Tallet, J. A. (1990). Volumetric visualization: An effective use of GIS technology in the field of oceanography. Oceanography 3 (1):23-29. Mason, D. C., O'Conaill, M. A., and Bell, S. B. M. (1994). Handling four-dimensional geo-referenced data in environmental GIS. International Journal of Geographical Information Systems 8 (2):191-215. National Research Council. (2004). A Geospatial Framework for the Coastal Zone: National Needs for Coastal Mapping and Charting, Washington, DC: National Academy of Sciences Press, 149 pp. National Research Council (2011). An Ocean Infrastructure Strategy for U.S. Ocean Research in 2030, Washington, DC: National Academy of Sciences Press. Paolo, D., Adam, L. and Helen, G. (2017). Oceanographic and Marine Cross-Domain Data Management for Sustainable Development. Hershey, PA, USA: IGI Global. Roberts, J. J., Best, B. D., Dunn, D. C., Treml, E. A., and Halpin, P. N. (2010). Marine Geospatial Ecology Tools: An integrated framework for ecological geoprocessing with ArcGIS, Python, R, MATLAB, and C++. Environmental Modelling & Software 25 (10):1197–1207. Roberts, J. J., Best, B. D., Mannocci, L., Fujioka, E., Halpin, P. N., Palka, D. L., Garrison, L. P., Mullin, K. D., Cole, T. V. N., Khan, C. B., McLellan, W. A., Pabst, D. A., and Lockhart, G. G. (2016). Habitat-based cetacean density models for the U.S. Atlantic and Gulf of Mexico. Scientific Reports 6:22615. Valdes, L., Fonseca, L. and Tedesco, K. (2010). Looking into the future of ocean sciences: An IOC perspective. Oceanography 23 (3):160-175. Valavanis, V. D. (2002). Geographic Information Systems in Oceanography and Fisheries. London: Taylor & Francis. Wright, D. J., Gallo, D. G., & Schubel, J. R. (2016). Ocean solutions, earth solutions. Redlands (California): Esri Press. Wright, D. J., and Bartlett, D. J. (2000). Marine and Coastal Geographical Information Systems. London: Taylor & Francis. Wright, D. J., and Goodchild, M. F. (1997). Data from the deep: Implications for the GIS community. International Journal of Geographical Information Systems 11 (6):523-528. Wright, D. J., Blongewicz, M. J., Halpin, P. N., and Breman, J. (2007). Arc Marine: GIS for a Blue Planet. Redlands, CA: Esri Press.